BottleCycler’s ‘Bottle Crusher’ is compact, quiet and user friendly: in your service area it will generate: 50% reduction in labour, 80% savings in space, elimination of noise and improved OH&S management. All crushed glass is recyclable and BottleCycler offers the complete service for a fixed monthly fee (machine and maintenance, glass collection, bin cleaning). BottleCycler Pty Ltd is introducing the concept of on-premises bottle crushing in the (Australian) glass recycling industry. To date the main focus has been the hospitality industry. This on-premises crushing is achieved by using a machine designed to reduce the volume of empty glass bottles by 80% in a quiet and efficient way. The Bottlecycler service team takes care of maintenance of the crusher and bins, and also collects the glass on a regular basis. For hospitality outlets the volume reduction leads to lower collection cost, savings in storage space, less handling, less noise problems, a significant reduction in OH&S risks and a tidier workplace. For larger hotels the savings can amount to $30,000 per year, measured in opportunity cost of $25 per hour. Up to 50% of the monthly fee for the crusher and service is usually already recouped by the reduction in collection cost or by saving 15 minutes daily on labour costs. For glass collectors the concept of on-premises crushing leads to better efficiency; a higher value per payload, lower pick up frequency 9glass instead of air) and less contamination of the cullet. Implementing the BottleCycler in glass recycling collection can result in a 60% higher gross profit margin per payload. The collected glass, finally, is taken to the Visy processing plants in Sydney and Melbourne for automatic sorting. At this stage the crushed glass particles are called cullet. Bottlecycler has adapted the output from the crushers to meet Visy requirements and can guarantee a recovery rate of bottle glass for recycling that is far above industry average. 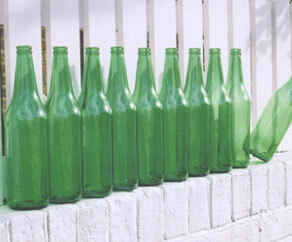 The BottleCycler processed cullet will be used to make glass containers again provided the cullet is sorted by colour. Because the glass cullet is not contaminated with foreign materials like ceramics or ovenware and of consistent quality and size, the residue can be on a record low. This residue can be processed for cement or sandblasting material. Any remainder will provide a compact and inert landfill material. This diagram illustrates the major savings, which can be made through implementation of the BottleCycler in the glass container recycling process. Currently only 10% of all glass collected from the hospitality industry is getting recycled in the end, the other 90%! ends up in landfill. This is due to inefficient logistics and ongoing contamination. The bottle truck collects from 10 venues, 9 venues the glass load is perfect but the last venue has a contaminated load, meaning it contaminates the complete truckload. Due to limited processing facilities most bins filled with bottles, broken glass and contaminants end up in landfill. Bottlecycler Glass Management Services uses dedicated trucks which exclusively collect the clean glass cullet, processed by the BottleCycler crusher. This cullet will deliver a minimum of 80% of beneficiated glass cullet, used to make new bottles! The benefits for the environment are significant. Early stage crushing eliminates most of the noise pollution attached to the process of collecting glass, it improves the overall quality of the recyclable glass cullet (resulting in a higher recovery rate) and it reduces CO2 discharge in the atmosphere. As an unique and major component of our full on-site service model the quiet BottleCycler glass crusher enables a 'painless' and cost effective implementation in the hospitality industry with benefits for every participant in the supply chain: the bar proprietor, the collectors, the neighbours, the recyclers, the glass industry and of course the environment.